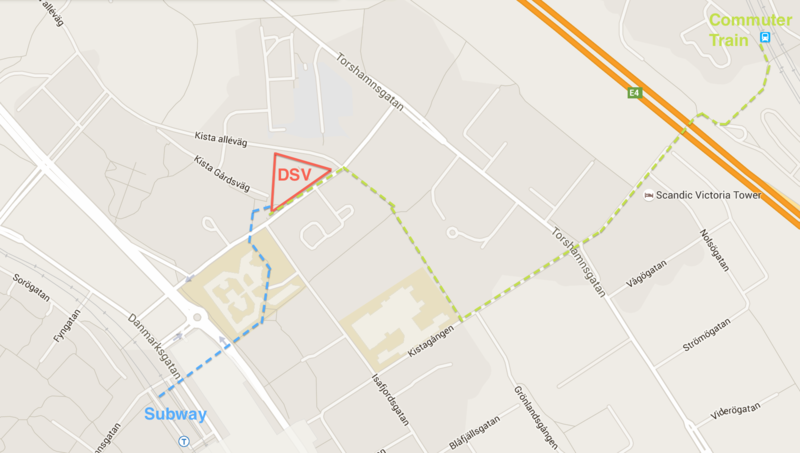 It can be a bit tricky to find new places for the first time, therefore we have put together a guide for how to get to DSV in Kista. Take the blue line (11) towards Akalla and get off at Kista. Go out through the north ticket hall, in the trains direction, if you come from T-centralen, and turn right after the escalator. Then pass straight through the mall, keep left and pass the Forum building, keep the same road and walk across the footbridge – you will now have Nod on your right side. Get off the commuter train at Helenelund. From there you can walk or take a bus to Kista. If you are walking, go out through the ticket hall and take a right. Follow the street and after about 900 meters, turn right onto the walkway. Follow the walkway until Borgarfjordsgatan and take a left – you can now see Nod on your right side.